Update 24 Mar 2013: I have Finally launched the Official Crisis Cleanup Blog, including a more up-to-date version of this post. 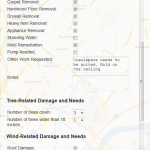 Over the past several months a few developers and I have created a Collaborative Work Order System for disaster recovery (now at CrisisCleanup.org, Twitter: @CrisisCleanup). The project is open source under the Apache 2.0 License, and is a gift to the community. 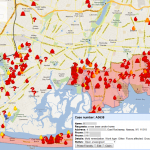 The system is now being used to manage recovery efforts in Connecticut, New York, New Jersey, Mississippi, and Georgia. The National VOAD will formally adopt/assume the project in May at the National VOAD conference. Many thanks to the dedicated work of Andy Gimma, Jeremy Pack, Chris Wood and dozens of others who have made this volunteer effort more successful than I could have ever imagined at the outset. The platform implements a �Craigslist� philosophy to recovery efforts�organizations that are aware of work orders enter them into the system, and organizations with capacity to help can claim and perform the work without interference from any centralized organization. This minimizes duplication and maximizes communication, coordination, and efficiency. No single organization can guarantee that any of the individuals in the system will be served. 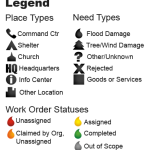 However, using the same system will permit inter-agency coordination, situational awareness, and help participating organizations prioritize their limited resources. And sharing work order information among dozens of organizations maximizes the chances that a client will receive help. 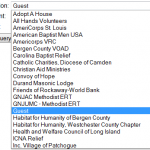 As of right now, more than 90 relief organizations and agencies with more than 30,000 combined volunteers are using the system to coordinate Hurricane Sandy relief efforts. 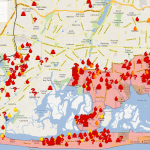 The system is managing more than 4,900 homes in need of gutting and rebuilding from Connecticut, Long Island, New York, New Jersey, Mississippi and Georgia. 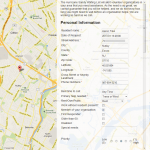 An organization must have a physical presence in the disaster area. An organization must either perform home assessments and/or perform gutting, mucking-out, debris removal, mold abatement, or rebuilding. An organization must be reputable. This generally means that the organization must be non-profit, or a member of National VOAD, a state VOAD, a County VOAD/COAD, a local government agency, or come recommended by a VOAD member or government agency. The current implementation requires a password. However, I have posted a training video that explains how the system works. I’ve also included screenshots below. Retired Admiral Thad Allen observed that in the military, they operate under a “Unity of Command,” but in private sector disaster recovery, the best you can hope for us “Unity of Effort.” This tool facilitates Unity of Effort without striving for the mirage of private sector Unity of Command. I don’t want to be in charge of your organization’s activities, or tell you what to do. The system should enable, not interfere with your existing business processes. No single organization should be in charge of others without their consent. The system should make collaboration and communication not only convenient, but required. This is not the “One App to Rule them All.” Do not stray too far from the system’s strengths. The system is open (but not public), and should therefore not contain sensitive personal information. There are two approaches to app development. The first is to create a mammoth, fully-integrated system that tries to be all things to all people. Sahana is a great example of this approach. However, even the most successful of these apps can be overwhelming and tend to be a jack of all trades but master of none. The second approach is to try and create a relatively lightweight app that does only one thing very well. These apps are generally far more user-friendly; but their success comes with a cost. Without careful curation, these apps can be highjacked, forced to do things outside their core competency, and grow into unwieldy mammoths. The Collaborative Work Order System definitely falls into category 2. There is no such thing as “The One App to Rule Them All,” and this is no exception. The Collaborative Work Order System excels at coordinating tens or hundreds of thousands of volunteers from multiple organizations, to thousands or tens of thousands of work order sites across a large geographic area; improving communication, and improving inter-organization coordination. But there are certain things for which it should never be used. For example, because the system is open (but not public—there is an important difference), it is inappropriate to use the system to store sensitive personal information. The system’s power to coordinate and facilitate communication comes from its openness; but some things were not meant to be shared, such as confidential case management information, volunteer details, etc. The Collaborative Work Order System is not, and can never be, all things to all people. 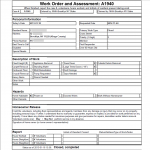 The Collaborative Work Order System should never be used to store sensitive personal or case management information. In the disaster recovery community, we talk a good deal about VOAD’s 4Cs: Cooperation, Communication, Coordination, and Collaboration. One reason these ideals are so difficult to achieve is because, even though we don’t like to admit it, most disaster recovery organizations are essentially competitors. Of course, we all get along in the field, forging deep and lasting friendships while we labor side-by-side in the service of our fellows in distress. But almost all relief organizations (with exceptions like Mormon Helping Hands and Occupy Sandy) rely upon grants to fund their operations. Passive competition for scarce grant resources means that every organization wants to be in charge. In an effort to qualify for the next grant, each organization strives to direct the work of other organizations and, most importantly, each organization wants to control the flow of information. These tensions create natural barriers to the 4Cs. In addition, organizations with employees have a tendency to perpetuate inefficiency. Even though efficiency saves the organization money, efficiency may also eliminate jobs. Therefore, most bureaucracies are suspicious of or downright hostile towards new or efficient technologies. In short, a collaborative work order system hasn’t been developed until now because: 1. Everybody wants to be in charge; and 2. Internal bureaucratic interests run counter to efficiency. First, allow me to start with a disclaimer: The Collaborative Work Order System is neither developed nor formally endorsed by The Church of Jesus Christ of Latter-day Saints/ Mormon Helping Hands, and this blog post represents my own opinion and not the official position of the Church. In my role as New Jersey VOAD representative for the Church, I have had a wonderful opportunity to tackle these difficult problems during Hurricane Irene, the June 2012 derecho storms, and Hurricane Sandy. First, because Mormon Helping Hands relief efforts do not rely on government grants, it has no economic incentive to be “in charge” of other organizations. We just want to help everyone get the job done. This non-threatening approach is designed to facilitate an organization’s existing business processes, rather than impose new processes. As Joseph Smith taught, people can “govern themselves” when they operate according to correct principles. And based upon the participation of more than 90 organizations, the approach works. Second, unlike most other relief organizations, Mormon Helping Hands relies exclusively on volunteers with families and full-time jobs. Unlike employees, volunteers have a natural inclination to work efficiently, and are therefore more open to adopting disruptive or efficient technologies. Mormon Helping Hands volunteers (as well as Occupy volunteers) don’t get paid, and if they’re anything like me, they must hold down a full-time job make time to see their wife and five cute kids. Volunteering efficiently improves my personal bottom line. The Collaborative Work Order System’s technology is not new or particularly innovative. Due to the great work of developers like Jeremy Pack, the user interface is great, but not groundbreaking. In fact, if I leave you with the impression that the Collaborative Work Order System is just a cool technology, then I have failed. This system does not evangelize technology; it evangelizes a philosophy. 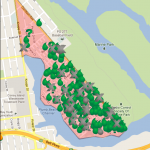 The real innovation of this system is the ability to coordinate tens of thousands of volunteers from dozens of organizations to thousands of sites after a disaster. The Collaborative Work Order System proves that it is possible to create a near frictionless technological platform where inter-organization Cooperation, Communication, Coordination, and Collaboration is not only convenient, but required. 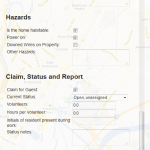 Since launching CrisisCleanup.org, the mostly volunter-driven project has received a lot of attention from FEMA, and VOADs across the country. If all goes well, I intend to give long-term stewardship of the project to National VOAD, which will be in a better position to evangelize and maintain the project long-term. 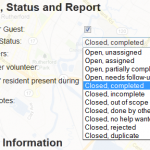 Streamline joining CrisisCleanup.org, and allow organizations across the country to join during peacetime. Adapt the tool for Long-Term Recovery (LTR) including Rebuilding and Refurbishing. As you can see, we have a long list of high priorities. We’re making slow progress, but hopefully we’ll be able to get some funding to continue development. GNJAC Methodist ERT Never Alone, Never Afraid Inc. Scope of Project: The system is primarily focused on the assessment, gutting, and rebuilding phases of recovery. It does NOT handle case management, inventory control, or volunteer management, etc. However, it will track volunteer hours. Can the system be adapted outside of the New York/ New Jersey area? Yes. The system is geographically agnostic. How much does the system cost? I don�t charge (and don�t plan on charging) organizations to use the system. In addition, the code is free to download, adapt, and install. It is open source, provided under the Apache 2.0 license, and was created by volunteers. Although the code is free, hosting and programming is not. Hosting costs vary from $50-$200 per month, depending upon usage. Ongoing programming support will also require funding. Right now a generous volunteer is paying for the hosting out of his own pocket, and volunteer programmers have created the system. I will probably need a long-term funding source. Have you considered crowdsourced funding? Yes, I’ve considered everything, including crowdsourced funding. But I only have so many hours in each day, and when I’m not cleaning up a hurricane or being a dad, I have a pesky full-time job to maintain. If you’d like to help get funding, drop me a line. Can I install a version for myself? Yes, but I wouldn�t recommend that right now. You�ll need your own developer, and because the system is being improved, you�ll have to manually install all new patches as they come out. Instead, the system will be designed to handle any number of new incidents as they arise. You will be able to create a new incident in the existing system, any time. What if a disaster happened tomorrow in my state? Could we use this system? Short answer: Yes. 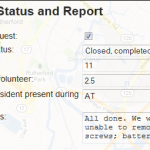 Long answer: Right now it will take 6-12 hours to set up a new incident in the system. We�re making programming improvements that should turn around that time to near zero. What are the long-term plans for the system? The code will always be open source and available to anyone who wants it. I hope to be able to offer the service for free to any voluntary organization who needs to use it, also. But I�m making this up as I go along, and I feel like I�ve been constructing an airplane while in free-fall, writing the owner�s manual and giving status updates for the past 2 1/2 months. Will the system do case management? No. Because of the open nature of the system, it is not appropriate to store or track confidential case management information using this system. The system is primarily focused on the assessment, gutting, cleanup, and rebuilding phases of recovery. It does NOT handle case management, inventory control, volunteer management, etc. However, it will track volunteer hours. Will the system adapt for long term recovery? Yes, with limits. We are adapting the system to do long term recovery for property, but not other aspects of LTR, such as case management. What does the system do best? The system is designed to organize and coordinate tens or hundreds of thousands of volunteers from multiple organizations, to thousands or tens of thousands of work order sites across a large geographic area; improve communication, and improve inter-organization coordination. It has been successfully used to deploy more than 30,000 volunteers during Hurricane Sandy, and manage more than 4,600 work order sites. Will this system manage Spontaneous Unaffiliated Volunteers (SUVs)? No, not really. Because the system includes location and contact information for clients, it would not be prudent to allow the entire public to access the system. Consequently, SUVs must first affiliate with an organization before using the system. This system is great! Can you make it do something else? : Yes! If you give me a programmer (or a grant), it will be done tomorrow. Until then, the answer is probably “not for a while,” but there is probably a workaround that will get the job done for now. Bugs: We’ll fix bugs as volunteer programmers have time. How do I�? I cannot provide technical support. I have found that the training video answers 95% of questions. Please watch it. If you figure out how to do something, chances are someone else would like to hear about it. PLEASE email me your how-to, and I will include it in the knowledge base. Will you give me a report? No. I’ll probably give you a username and password and let you pull your own reports. Information for Programmers: The source code is released under a Apache 2.0 License. Here is a list of open issues. Please grab a bug, submit a patch, and start working! I’m in desperate need of volunteer programmers. I feel like I’ve been constructing an airplane while in freefall, writing the owners manual and giving hourly status reports for the last 1 1/2 months. We’re now gliding, but I need help building the rudder, landing gear, and gas gauges. Please comment below if you’re interested in helping out. Thanks! 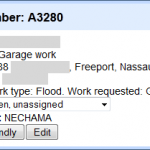 This entry was posted on December 20, 2012, 11:02 am and is filed under Disaster Recovery. You can follow any responses to this entry through RSS 2.0. You can leave a response, or trackback from your own site. Hi I am very interested. I am in the GIS program at Univ of Maryland focused on disaster response. I will review the video, grab a bug and start working!. Very excited to come across this.